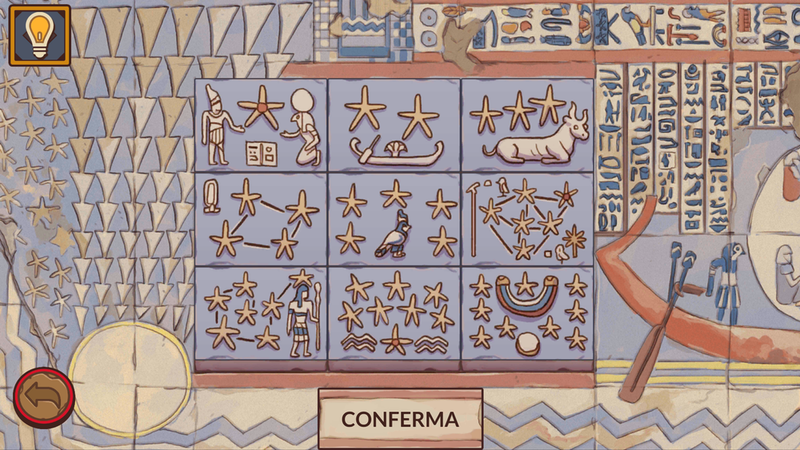 Maggie – The Treasure of Seshat is a mobile puzzle game for 7-12 years old kids developed by Studio Evil for Soroptimist International Club of Italia. The protagonist is Maggie, a young explorer searching for the treasure of Seshat, ancient Egyptian goddess of mathematics and writing. During her quest Maggie will solve 20 increasingly difficult puzzles, leading the player to engage with 5 of the most important mathematics topics for primary school. The brave but familiar main character, which is easy to identify with, and the mechanics of reward and customization encourage young players to test themselvs, away from the worries and anxiety often associated with mathematics at this age. The game is available for free on Android and iOS stores. Maggie is witty and brave. She accepts challenges and transforms them into enjoyable growth opportunities. Maggie carries along a small notebook whose pages she uses to make little airplanes, because she loves to travel and discover new places. She has a group of good and nice friends –boys and girls- who help her in the quest for the Treasure of Seshat. Everyone will enjoy playing Maggie’s role! Rules, formulas, calculations: mathematics is scary. Presenting this as an intellectual challenge, as problems, thus doing away with the assessment anxiety which will be replaced by the desire of making Maggie advance in her adventure –this is the clue the game offers to attract girls and boys to to mathematics, to its logics and its contents, with no fears. The choice of this character is meant to convey a clear message against gender stereotypes which may develop during the early school years and are often consolidated. Challenger is an elderly gentleman, nice yet grumpy, who is convinced that girls like stories and boys like real actions. Maggie will prove that both girls and boys can be fond of the same things and can reach the same goals.